Question: What do you get when you mix one cup of milk, one cup of mayonnaise, and one cup of whole wheat flour? Answer: The most amazingly delicious crust you can imagine. 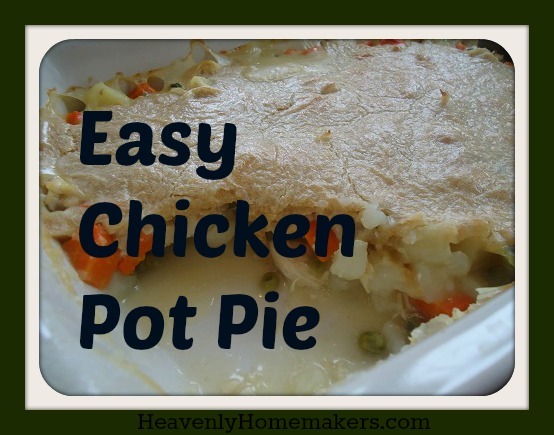 Question: What is the easiest way to make a crust for a Chicken Pot Pie? Answer: You know the “one cup of milk, one cup of mayonnaise, and one cup of flour” I referred to? 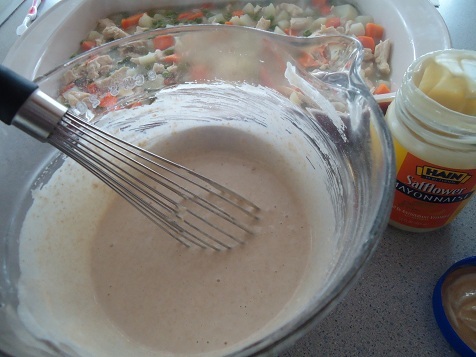 Mix it up and pour it over the top of your pot pie filling, then bake. It doesn’t get any easier. No mess. No rolling. No problem. Question: How much does it cost to make this healthy, hearty Chicken Pot Pie? Answer: Would you believe me if I told you that it only costs $6.00*? It’s true. This recipe feeds 8-10 people. (Eight if you’re my family. Ten if you aren’t feeding teenage boys.) That makes the cost of this recipe between $0.60 and $0.75 per person. And it’s a complete, filling, healthy meal. Question: Is the rest of this post going to be as cheesy as what I’ve read so far? Answer: Ummm…no. But I do want you to know that I’m currently working on more ideas for this milk/mayo/flour crust mixture. I got the idea from Matt’s cousin Monica, and I’m thinking that the possibilities are definitely not limited to Chicken Pot Pie. Can’t wait to figure out more ideas! 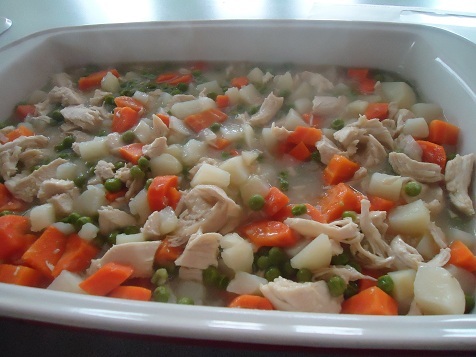 In a large cooking pot, boil broth, chicken, carrots, potatoes, and peas until veggies are tender. Mix cornstarch with water until smooth. Stir mixture into the broth/veggies, cooking for about one minute on the stove to help the mixture thicken. Pour contents into a 9×13 inch baking dish. In a separate bowl, stir together milk, mayo, and flour. Spread mixture over the veggies in the baking dish. Bake in a 350° oven for about 45 minutes or until the crust is golden brown. In a large cooking pot, boil broth, chicken, carrots, potatoes, and peas until veggies are tender. Mix cornstarch with water until smooth. Stir mixture into the broth/veggies, cooking for about one minute on the stove to help the mixture thicken. Pour contents into a 9x13 inch baking dish. In a separate bowl, stir together milk, mayo, and flour. Spread mixture over the veggies in the baking dish. This is a great way to use up leftover chicken and broth. And I love one-dish meals! This is just one more recipe that proves that healthy eating doesn’t have to be expensive! 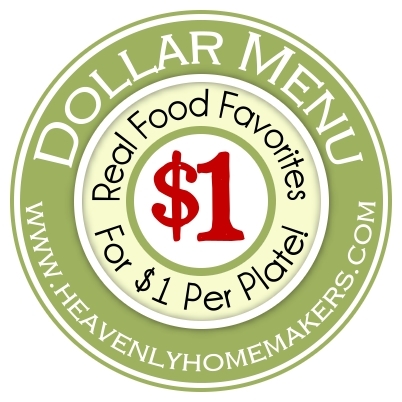 Stay tuned for many more recipes and ideas for our Real Food Dollar Menu! Looks delicious! We had chicken pot pie without crust earlier this week. We put it over rice. Yum! Wow! This looks great! I’m going to put it my menu! Have you ever tried it with different types of flour . . . like gluten free flour or spelt ? I am thinking this would even cost LESS for me because I a make my own mayo AND I often use leftover veggies and meat for this type of meal. I haven’t tried, so not sure how it would work! Laura, can you sub white for wheat flour in your recipes. I can’t have wheat products. Thanks in advance. I’m curious about that too. May try it tonight. It should work since the original recipe has not leavening and the egg/mayo is good binder to deal with the lack of gluten. However, I would start with only 1/2 cups of mayo and milk because gluten free flours tend to require less liquid. I revised this recipe by using rice flour, 1 1/2 T of melted butter (for browning), 1 1/2 T baking powder. Came out great! I substituted fresh ground spelt flour and it turned out delicious. I use tapioca flour and it turns out fine. Thanks Laura! I can’t wait to try this. Why have I never heard of this easy crust before? Oh, by the way I made your popcorn chicken recipe tonight for the first time and all my kids really liked it! What would I do without all your guidance? Blessings to you & yours! I’m going to have to remember this one. I actually have all the ingredients! That’s always nice. Thank you, Laura! Oh, this looks delicious! I would like to try it as the top of Shepherd’s Pie instead of the traditional mashed potato topping. I love chicken pot pie. Ive never seen a recipe with Mayo. My hubby (stay at home and does most of the cooking) makes his from scratch (betty crocker recipe). SOOOO YUMMMYYY!!! My daughter says its fer favorite pie. Can you taste the mayo in this? I can’t stand mayo but this recipe looks so good and easy. However, my stomach turns at the thought of putting mayo in it, yuck! Anything you can sub for the mayo? I just can’t bring myself to put mayo in this. Forgot to answer your other question – maybe sub yogurt? butter? milk that’s thickened with cornstarch or arrowroot powder? what if you used some yogurt or sour cream, and added an egg yolk or two and a touch of acid like vinegar or lemon juice in substitution for the mayo. I am resisting the mayo because the Hain mayo is so expensive and it hurts to use a whole cup at once. 2 1/2 c soft white flour, 1 tsp. salt, 3 T milk, 2/3 c olive oil. Toss ingredients together and roll between waxed paper. Flip over on top of filling. Cut slits into top. Bake @ 350. I pretty much make my filling the same way you do, Laura, I just pre-cook it slightly in a saucepan and thicken it with soft white flour/water. Then I pour into 9×13″ pan and let cool a little before adding crust topping. That way the vegetables are sure to be tender and the crust doesn’t get too brown. By the way, this crust works GREAT for quiche, too. And you can just press it into the pan if you want before adding filling. Yum! Yum! I love that you don’t have to roll out the topping! I am loving this series. Thanks for the great recipe! At what stage would you freeze it, before cooking the pie topping or after? Thanks! you could freeze it without the topping and add the topping right before baking. otherwise i think the topping could sink in and get lost through the freezing and defrosting process, possibly. This just might be supper tonight… Sounds great as we are mostly dairy-free due to our little buddy’s allergy and original unsweetened almond milk will be an easy substitute, and I have leftover chicken bits and some broth. I might use rice instead of potatoes since that’s another leftover in the fridge. Or both, since I just remembered I have both! Another experimental throw-together, as my mother would call such a meal! It looks great, but I would have to add some salt and pepper to the vegetable mixture! Might want to specify cold water for the corn starch. I made the mistake once of adding it to hot water and it just all lumps and never dissolved. I’ve sure never done that again! Laura, I am honored to see my name on your site. I made this recipe after Christmas and used the left over gravy to thicken it. The only thing I didn’t use was potatoes and I added an onion. Looks delicious! I also wanted to know about mayo substitution because my son has an egg allergy. Would yogurt work or is that not thick enough? Do you think the crust would work with just the flour and milk? This recipe as is, is very high in calories and fat. It would be great to see variations of your recipes that are health conscious/for people that need to watch their weight. understand being health conscious and your hesitation to eat high fat/calories. I have researched and come to different conclusions about what is “healthy”, compared to what the FDA tells us is healthy. I would love opinions on using egg free mayonaise and alternative flours for this. My 18 mo. old has an egg intolerance we learned about the hard way and I am trying to remove gluten from our diets. We love chicken pot pie! I made this last night with freshly ground millet flour and it worked fine. It really doesn’t need the gluten since you aren’t making a true dough out of it. I LOVE this idea. I would need to find out, as well, about the gluten free topping, but from what I’ve read (I’m new to the gf thing) it would work fine with a pre-made flour mix. Also, for the poster that wanted to sub the yogurt for the mayo, I think greek yogurt would be a great substitute. Yay you made supper tonight yummy :D! I didn’t have all of the ingredients, but I made it work! I didn’t have any broth and didn’t feel like boiling the carcass in the freezer and making broth so I just boiled my pack of chicken with seasoned water and used that as the broth! I didn’t have any potatoes so I just omitted those, and my husband doesn’t like carrots so I boiled my chicken used the broth water to put some flour in and just used what I needed from it to bake in the oven. For the crust I used organic biscuit flour I had in the cabinet instead of the whole wheat with the milk and mayo!I didn’t have to cook mine nearly as long as the recipe said, though so watch your times with your ovens! My husband doesn’t really care for mayo either, and he didn’t say anything about an odd taste! It was very good! I love this idea. Great, simply recipe and so many ideas are coming to mind! What a great way to use some garden veges this summer, like squash, peppers, whatever little bit you have. Also, I think this would make a great way to use any leftovers, for instance turkey from Thanksgiving. I’ll definitely be making this soon! I just love potpie! I made homemade cornmuffin/corndog muffins the other day and was out of eggs. I replaced the eggs and oil with mayo and they were so delicious! Thanks for posting this terrific, easy, recipe for good comfort food! Your crust recipe seems too good to be true, I can’t wait to try it. I don’t mind rolling out crust, it’s cleaning the counter afterwards that I hate! Laura thanks for the great recipe! I have been failing at menu planning the last few weeks and must have seen the subject of your post but didn’t open the email. So I was surprised when I went to check my email for something else today and saw the title of your blog post. I thought to myself ‘well that is awesome, cause I was thinking of chicken pot pie for dinner’. This was great! I LOVED the crust. Mine potpie was much ‘brothier’ then yours LOL. But I toasted up some bread so we could sop up the extra broth. I didn’t have any peas so I added some green beans and corn. I also sauteed some onions and garlic then cooked my chicken cubes. Added the broth, potatoes and carrots. Next time I might cut back on the broth just a bit. But I loved it! I wasn’t looking forward to making a pie crust tonight. :-) Thanks again!!! Sounds good Laura. My guys love chicken pie. Daughter made this for a yummy new dinner tonight. Yum! I made chicken pot pie earlier this week (http://kansaslife.wordpress.com/2013/01/16/mix-and-match-pot-pie/) but I think yours is a *much* healthier version! I thought I would mention that any type of flour will work for this. My son was just put on a modified diet of no wheat or dairy yesterday. So in a pinch, I tried this with an alternative freshly ground grain and almond milk and it worked very well. Thanks for the inspiration, Laura. We enjoyed this tonight–though I ended up making our normal pie crust at the last moment. Am curious what others thought of the taste of the mayo crust. I had mine mixed together, but freaked at the overwhelming smell of mayonnaise and wondered if that might be all we’d taste when it was done. Comfort food at its best! Thank you for another quick, easy, and budget stretching recipe. I have a recipe that is somewhat similar but I make homemade spelt flour biscuit dough and place flattened circles of that on top before baking, it is wonderful! Making this today, but splitting mine into two 8 inch casserole dishes and putting one in the freezer for another evening! Thanks for the idea….I tasted this before adding the cornstarch and thought I might just make it like that one time, stop there and serve it….yummy! Thanks for the recipe! I tweaked it for gluten free by subbing the flour for rice flour, added some melted butter and baking powder. Came out great! Just wondering, if I were to split this in 2 and freeze one, should I cook them both in the oven or heat everything up, dump in a Pyrex dish pour crust over top and then freeze? Also would you recommend thawing or cooking from frozen? I think I’d bake the one you want to serve that day, but freeze the second one without baking it first. Then, I’d put the frozen one in the oven, turn the oven on, and bake it at about 300 – adding about 30-45 extra minutes of baking time. Made this tonight and it was delish! I love how simple the crust was! I made a few changes: I used a lb bag of mixed frozen veggies and chopped up about 4 small potatoes. 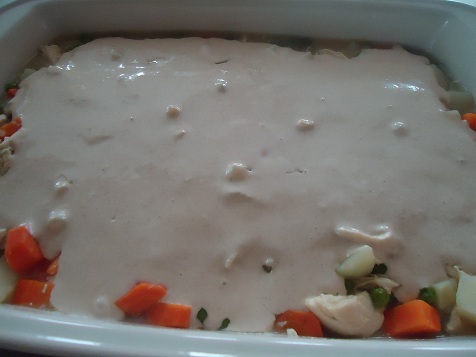 I didn’t boil the mixture-I made a gravy (1/4 c flour and chicken fat and 2 cups chicken broth, seasoned with poultry seasoning) and mixed raw potatoes, frozen veggies, and chicken with the gravy in my dish. Topped with crust mix and baked. It took an hour for mine to get as brown as yours. Thank you for a great recipe! Made this for dinner tonight, it came out fantastic. Thanks for sharing your recipe. I made this for dinner tonight (it’s in the oven currently), it looks GREAT, but I think my frozen veggies added extra (a ton) of water/liquid. It didn’t thicken at all on the stove top, even with 3 extra T of ww flour, LOL. By the time I got done messing with it it almost exceeded my 9X13 dish and then it was like soup so the crust is going to come out like dumplings HAHA. *SMH the things I do to perfectly good recipes sometimes, good thing my hubby and #1 daughter are running a late errand, dinner is gonna be LATE and a possible disaster :) Next time I’ll defrost all my veggies, etc (we freeze our potatoes b/c we don’t have a dark room/basement in this house). Oh no! Help! :) I just stuck this in the oven, but I’m thinking something went wrong. My crust sunk down below my broth! I have actually never made chicken pot pie before, so I didn’t realize when I poured the filling into the pan that there was probably too much broth, but I measured the broth and I know I put in about two cups of chicken and 6 potatoes (I guess they were medium?). I used onions instead of peas and I didn’t put in all the carrots, but that shouldn’t make THAT much of a difference, should it? We’ll see how it bakes up! Yum! Made this for dinner tonight and it was a hit with the whole family! We have a family of 5 and there were enough leftovers for 2-3 more servings for lunches tomorrow. They all asked me to put this on the regular rotation :) Thanks for sharing the recipe! Do you think sour cream would be an ok substitute for mayo? I dont have any on hand and I dont use it enough to buy any. I only ask because its pretty close to the yogurt idea. That would work out just fine! Hey, I wondered if you could help me out. First, let me say that I like your site very much. I ventured to make my first broth this week after cooking a chicken and dividing the meat for other meals. The first up was chicken pot pie. I do not know what happened. The crust wasn’t cooking all the way through, so after more than 45 min, I turned it all over(small bits at a time) and gave it a few more minutes. It helped but the final product was not crispy at all and still too doughy for just about everyone. I believe there was too much liquid. Quite a bit bubbled out onto the bottom of the stove during cooking. The inside was great, excellent flavor, tender veggies, we really liked that part. I have done this in the past with Bisquik based topping so I knew it should work. I was really looking forward to a healthier topping. My “dough” was not as runny going into my dish. Should I have thinned it out some? My wheat was store bought. Would that affect it? Do I need to adjust something? Any advice is greatly appreciated. It sounds like a combination of the dough being too thick and too much liquid from the filling. I would thin it out a bit next time. The store bought flour shouldn’t affect it. That would work fine, but you would also need to add eggs. The egg in mayo acts as a binding ingredient and yogurt won’t have that. I would try adding one egg and see how it turns out! Should still be delicious. If you have two eggs and a cup of healthy oil, such as olive oil, you can make your own mayo very quickly. I like to let the eggs warm to room temp, squirt of mustard (optional). Get out your hand mixer with the two little beaters on it and just pour in a little oil, beat at high speed. Keep the beaters going and moving around the bowl as you keep adding oil until it’s gone. This is the easiest and most foolproof way I have found to emulsify without problems. It takes about three minutes. Add salt if you want. I think the yogurt would work, but since it doesn’t have eggs or oil, it wouldn’t work in the same way. It would taste different and maybe wouldn’t stand up like we expect our pie crust to do. If you just want a substrate to put a chicken pot pie on top of, it would work well enough, I think. 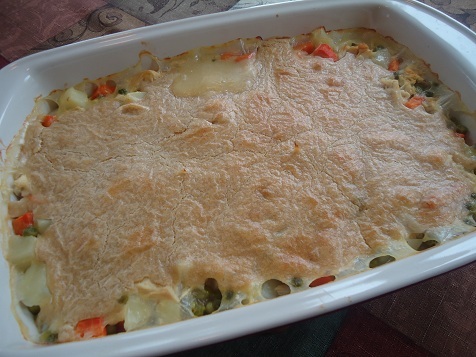 I make my pot pie very similar, except I use garlic, onion, celery, carrots and potatoes for the veggies. I’ll have to add some peas for color next time. I’ve had good success adding just enough broth to cover the cut up veggies. I don’t measure anything. If I have left over chicken gravy from a roast chicken dinner, I add it to the veggie/broth mix for flavor and thickening. Otherwise I use cornstarch/water. Our favorite crust for this is your yogurt pizza crust recipe, Laura. YUM! Great flavor and crunchiness. 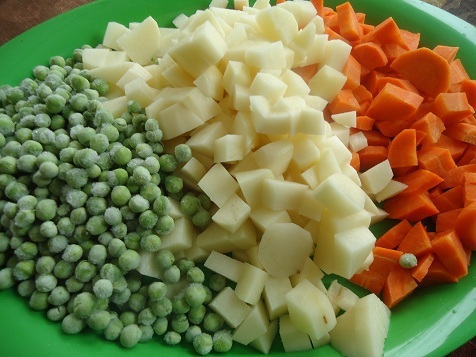 Any guesses how many total cups of veggies are in the peas, carrots and potatoes? We can’t eat potatoes so I’m going to sub with other frozen veggies. The potatoes are probably about 2 cups total and I guess the carrots are about 1-2 cups. It can vary because of size of the veggies. Hope the recipe turns out well for you! I made this tonight and it is delicious! My stomach still feels all warm and fuzzy from eating it :) A nice comfort food. My husband HATES peas and so I substituted the 2 cups of peas with 1 cup celery and 1 cup onion. If I were to make this recipe with the peas, I still would add onions because I love how they add flavor to recipes. I also realized at the end of the baking that the dish should sit out for at least 10 minutes so the crust hardens; I did broil the crust to help it harden. Thanks for this easy meal! It definitely makes a lot. I am filing this recipe away to use in a month when I have leftover turkey! Yum! Thank you for this recipe! Especially for the recipe for the crust-brilliant! I made 2 – using chicken, – and had intended to put one dish in the freezer for later, but my DH and I ate the extra one too-delicious! I’m a student coordinator that sends groups of college students to homeless shelters and sometimes we have to cook a meal for 60 or more on a budget of $140.00. I think this recipe is a great idea and will be using it! I also like all the options in the Dollar Menu meals. Thank you so much these recipes and this blog helps so much! I just made this pot pie, and it was so good – and super easy! I’d love to see more ideas for this milk/mayo/flour mixture. A ham pot pie, a cobbler type dessert, I’m sure you could come up with lots of creative ideas. Thanks for all the work you put into your blog, making our work in the kitchen so much easier and more fun. Could this be made gluten free/dairy free? I think it can be, though I haven’t tried it! I would imagine you can sub your favorite gluten free flour, and use coconut milk instead of regular. Hopefully!